Thank You, Barry W. Lynn, For 25 Years Of Service To Americans United! Today marks the end of an era here at Americans United: The Rev. Barry W. Lynn is officially retiring after 25 years of leadership. This is his last day. We all knew this was coming—Barry announced plans to step down earlier this year. But even as AU’s Board of Trustees began working to find his successor and we planned a celebratory gala for Barry, his departure seemed like an abstraction. Barry was still out there, giving speeches to chapters, being quoted in the media, and running staff meetings. But today it’s real. His office is empty. Barry is being sent off with some high-profile recognition. The Washington Post today ran an interesting Q&A with him. Religion writer Michelle Boorstein got Barry to tell some stories that even I hadn’t heard before. It’s definitely worth a look. 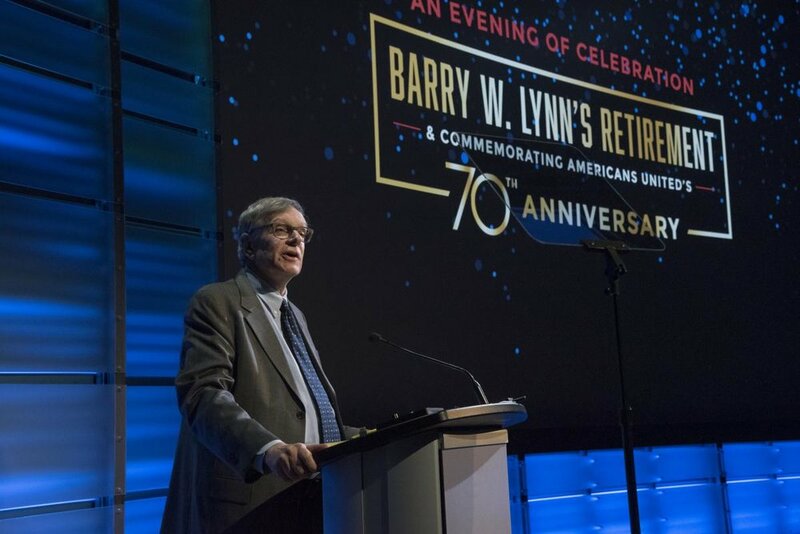 Also, if you missed our Nov. 2 event honoring Barry and celebrating the 70th anniversary of Americans United, you can watch that here. As I’ve noted before, this is a bittersweet time for Americans United. All of us are sad to see Barry go, yet we also know how hard he has worked here since 1992, and we understand that Barry has earned some downtime. We wish him the best in his retirement. Barry won’t want for things to do. His daughter recently gave birth to absolutely adorable twin girls, and Barry is already well enmeshed in the role of a doting grandfather. He’s a film buff and has been getting involved in local politics in the DC area. I know he’ll stay active in a number of causes dear to his heart. That’s just the kind of guy Barry is. For him, disengagement is not an option. As for the rest of us at Americans United, be assured that we’ll continue our important work. We’ll be here every day doing what we’ve been doing for years—writing, speaking, litigating, educating legislators, organizing activists, etc. AU’s professional staff brings decades of experience to the table. Our shared vision and commitment to this important cause will, with your support, be the beacon that guides us through this period of transition. P.S. One way to honor Barry’s quarter-century of service is to support the work of Americans United financially. The timing is right. Tomorrow is Giving Tuesday, and starting at 8 a.m., when you make a donation using the “donate” button on our Facebook page, or if you create an AU fundraiser through your own Facebook page, those donations will be matched thanks to the generosity of the Bill & Melinda Gates Foundation and several AU donors.